Wes Avila&apos;s Guerrilla Tacos, that magical intersection of taco trucks and farm-to-table dining, is finally putting down roots. On Friday night, at an invite-only party for Guerrilla Tacos&apos; fourth anniversary in Boyle Heights, Avila announced that his venture would soon be opening a brick-and-mortar location in the Arts District, Eater reports. According to the report, the new location is set to open next summer. A video of the interior showed that it might also have bar space. Eater also says Avila suggested in his speech that the opening of the restaurant might mean the retirement of the truck. 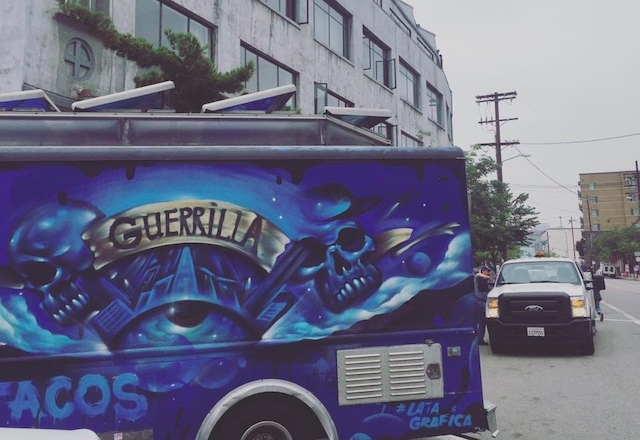 Despite their humble setup, Guerrilla Tacos has frequently been considered one of the best tacos in town, making LAist&apos;s list of "10 Amazing Tacos You Need To Try In Los Angeles", Eater&apos;s 38 Essential Restaurants and even Jonathan Gold&apos;s 101 Best Restaurants.